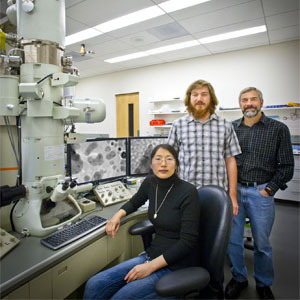 A team of scientists at the Lawrence Berkeley National Laboratory have reported the first direct observation of “jump-to-contact” between nanoparticles, the critical step in oriented attachment and the key to biomineralization. Through biomineralization, nature is able to produce such engineering marvels as mother of pearl, or nacre, the inner lining of abalone shells renowned for both its iridescent beauty and amazing toughness. 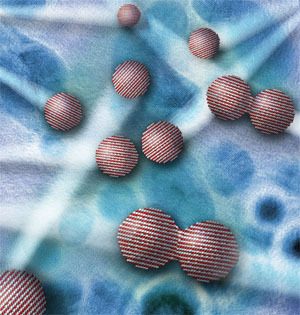 Key to biomineralization is the phenomenon known as “oriented attachment,” whereby adjacent nanoparticles connect with one another in a common crystallographic orientation. While the importance of oriented attachment to biomineral properties long has been recognized, the mechanism by which it occurs has remained a mystery. With a better understanding of oriented attachment it should be possible to synthesize new materials with remarkable structural properties. To that end, a team of researchers with the U.S. Department of Energy (DOE)’s Lawrence Berkeley National Laboratory (Berkeley Lab) have reported the first direct observation of what they have termed “jump-to-contact,” the critical step in oriented attachment. Be the first to comment on "Berkeley Lab Reports Direct Observation of Oriented Attachment in Nanocrystal Growth"